This cache will start near the main entrance to the park. At the above coords you will find the Nether millstone from Hartsford's Grist Mill. There is also a sign there with a lot of info about the mill.The stone measured how many inces in diameter? Subtract the first number of the diameter from the second number of the diameter and add your result to the following coords, N 40 33.029, W 080.36.363. That is your final where the Hartford's Mill once stood. 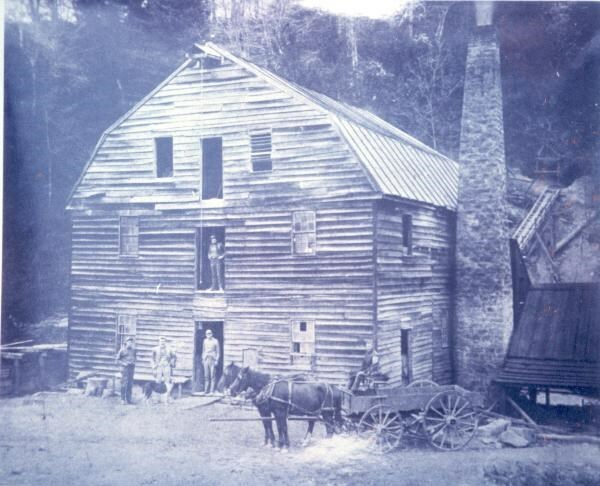 Hartford's Mill was built on tract of land that was purchased by the Joseph Coulter family on Dec. 17,1834 for $600. It measured 264 acres, 3 rods, and 27 perches. There is an old roadbed that leads to the site from Lower Laurel Trail. All that remains is the front stone wall of the mill, bricks from the boiler chimney, and some cut stones. There was even a coal mine on the other side of the stream that supplied fuel for the steam engine in later years. The mill was finally lost in 1905 for failure to pay the taxes on it. All that remains of the mill is several cut stones, bricks from the boiler chimney, and the front wall of the mill. There was a coal mine on the other side of the stream that supplied fuel for the boiler and steam engine. The ammo box will be easy to find. Parking for the final will be at 40 32.988, 080 35.744. You will see the trailhead across the street. It is well marked. For a super 1/2 day adventure, do this cache and "ELPO" ROCK on the same trip. If you do them both, it will be about a 3 mile wilderness hike. I must thank Graig Heaton for all the time and effort that went into the research about this park and development of his website with all the little known information that I needed to put together this cache.